The range of the Sambava Tomato Frog is Madagascar. 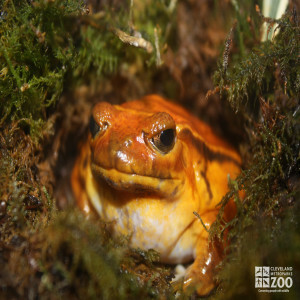 The Sambava Tomato Frog inhabits forest leaf litter near swamps, shallow pools or water-filled ditches. Incubation: Sambava Tree Frog eggs hatch after about 36 hours; tadpoles take about 2 months for development. Sambava Tree Frogs are nocturnal, being active in the evening and at night. This is a burrowing frog, spending most of its time half-hidden in underbrush waiting for food, or protecting itself from predators. The characteristic calls of this species can be heard at evening and night and sometimes during the day from swamps and pools after a heavy rain. They can inflate themselves as a defense against predation. The whitish skin secretions can produce allergic reactions in humans. Sambava Tree Frog males mount the females for sperm transfer. Breeding is accomplished in stagnant or very slow-moving water. The tadpoles are transparent filter feeders that float horizontally in mid-water.